Greenheads are a type of large biting fly that live in saltwater marshes from early July until early August. When they’re out in force, they can be a blood-sucking bane for beachgoers from North Carolina to Maine. Here’s what you can do to keep them at bay. Greenheads are big, roughly an inch long, and named for their large, distinctively colored eyes. Like mosquitoes, the females need blood to nurture their eggs. 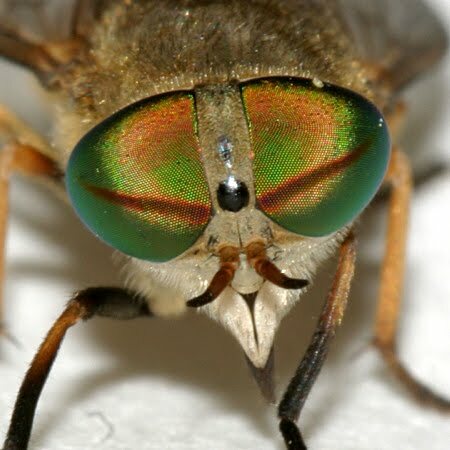 But unlike mosquitoes, which sip blood through a tiny proboscis, greenheads obtain their meal by ripping open victims’ flesh with razor-sharp, scimitar-like mouthparts. They then lap up the blood as it pools. And yes, having your skin torn open really hurts; welts often result as well. Cover up, especially around your ankles and lower legs—greenheads seldom fly higher than about 3 feet off the ground. Wear light colors. Greenheads are attracted to darker colors; blue is supposedly their favorite. Pray for wind. A steady breeze keeps them effectively grounded. Try using Avon Skin-So-Soft as a repellent, the most recommended chemical deterrent. My first-hand experience has shown that it does help keep them away, though not entirely. Identify which member of your group is most attractive to greenheads—and stick close to them. If all else fails, start a contest with your friends to see who can swat the most greenheads.